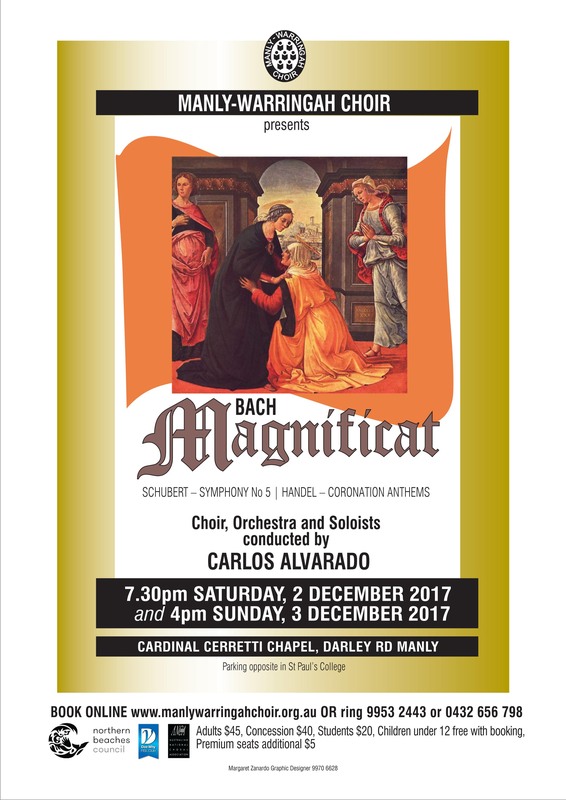 This December, audiences in Sydney’s north will have the chance to hear two very different settings of the Magnificat. On December 2nd and 3rd, Manly Warringah Choir will perform J.S. Bach’s version and the following week, Mosman Symphony Orchestra and Chorus will perform the setting written by Durante, but more often attributed to Pergolesi. 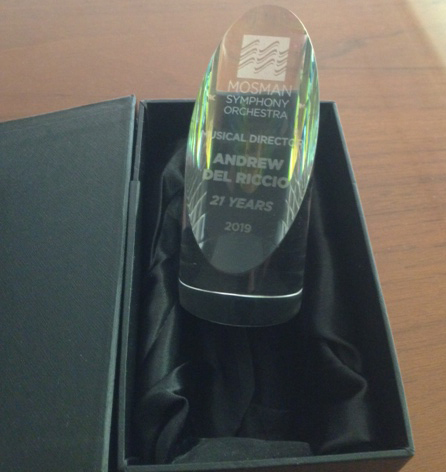 Our musical director, Andrew Del Riccio will be involved in both performances, playing trumpet at the Manly concert, and conducting the concert at Mosman. The Magnificat, also known as the Canticle of Mary, is particularly appropriate for the Advent season. The text comes from the Gospel of Luke (1:46–55) where it is spoken by Mary when she visits her cousin Elizabeth. The virgin Mary has been told by the angel Gabriel that she is going to have a child who will be the Son of God. When she asks how this could happen, the angel tells her she will be visited by the Holy Spirit so that the child’s conception will be divine. The angel gives proof that nothing is impossible by telling her that her cousin Elizabeth, who is old and past child bearing age is also pregnant. So according Mary goes to visit Elizabeth, and when Mary greets her, Elizabeth feels the baby (who is to become John the Baptists) move. Elizabeth praises Mary for her faith and Mary responds with what is now known as the Magnificat. The hungry he has filled with good things and the rich sent away empty. As he promised our fathers, Abraham and his descendants forever. As it was in the beginning, is now, and always will be, forever and ever. Amen. Deposuit potentes de sede,et exaltavit humiles. 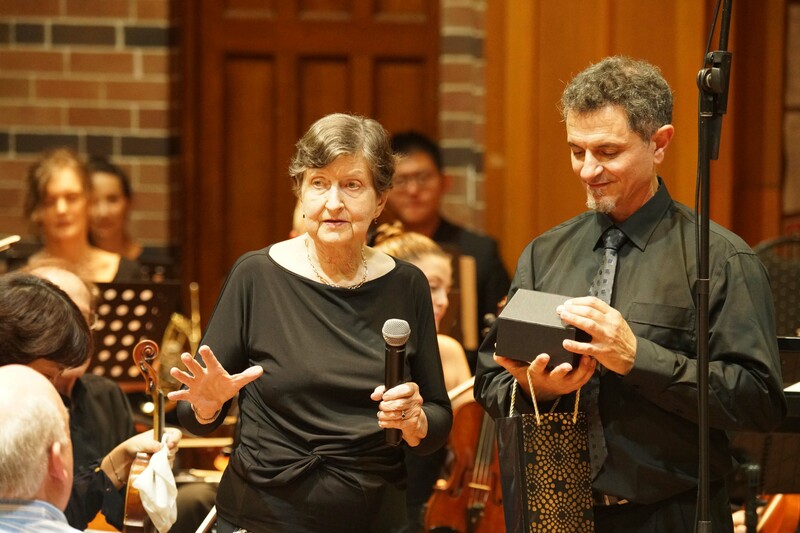 Many of you will remember that last year Mosman Symphony Orchestra gave the world premiere performance of Danza Arabica by Kim d’Espiney, who also plays oboe in the orchestra. That piece was characterised by sorrowful Moorish style melodies contrasting with vibrant energetic dance rhythms and was received with great enthusiasm by both orchestra and audience. On Sunday June 4 the Bourbaki Ensemble, conducted by David Angel will premiere a new piece by Kim. Con Fuoco, composed for strings, brass and percussion, will be the finale of a concert that also features Rachel Tolmie as cor anglais soloist in Richard Percival’s Sicilienne and Alan Ridout’s Concertino as well as works by Sibelius, Bartok and Vaughan Williams. 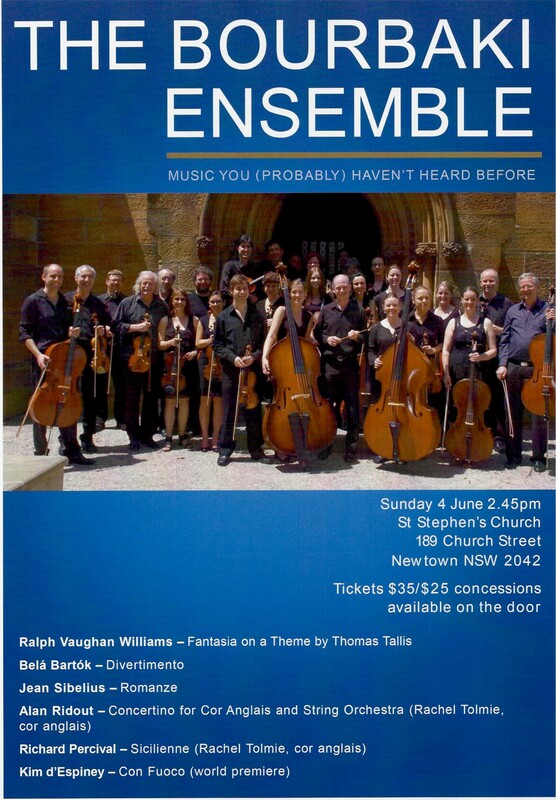 The concert will be at 2.45 at St Stephen’s, Newtown. I’m sure Kim would appreciate some friendly faces in the audience. Could there be a better way of spending a sparkling Sunday afternoon than in the company of exciting new music, with the coffee shops of Newtown beckoning for afters? Our fledgling choir, Mosman Symphony Chorus, is up and running, with rehearsals already beginning for our June concert when they will join the orchestra for a performance of Schubert’s Mass No. 2 in G. By all accounts the small, but very enthusiastic group is having a ball at Monday night rehearsals, with the joy of singing being augmented by the bliss of Rufina’s baking at supper. They would warmly welcome new members of all voice types. In the meantime our friends at Manly Warringah Choir will be performing Brahms’ German Requiem at the Cardinal Cerruti Chapel in Manly on Saturday May 6th at 7.30pm. This will be their last performance in Australia before heading to Carnegie Hall to perform the same work with choirs from all over the world at the invitation of Distinguished Choirs International New York, DCINY. The Manly concert will be conducted by the wonderful Carlos Alvarado, who conducted our Movies concert last year. There will be 2 outstanding soloists in Anita Kyle and David Greco. It would be great if we could support our fellow musicians by attending what promises to be an inspiring performance. The Mosman Symphony Orchestra drew a full audience to the Art Gallery last Friday evening with a program that was certain to thrill. The ever-popular “Tannhäuser Overture” composed by Richard Wagner in 1845 proved a treat, as the orchestra captured the complex nuances of this beautiful piece that attracted so much controversy around its premier performances. John Foster must be proud of his playing, as I was spell-bound. The Rococo “Trumpet Concerto in E-flat” by Johann Baptist Georg Neruda embraces the finest silk-like brass textures, and I wallowed in the seductive interpretation. The Beethoven 7th Symphony brought the orchestra to life, and the audience to its feet after raising us to the heights of musical colour – so prevalant in this devilish composer. Once again controversy reigns with this work – but so what! 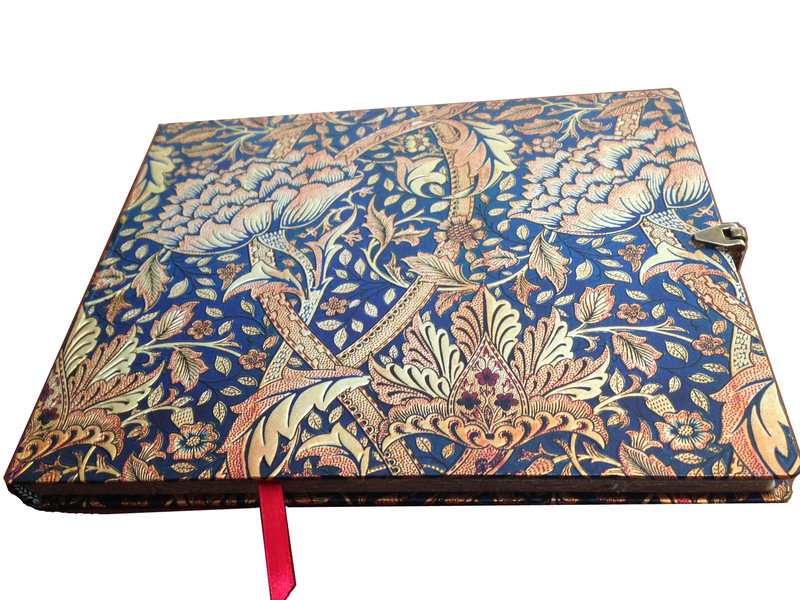 It’s a masterpiece unfolding meaning and beauty into our vibrant world of fine Art-Music. Well done MoSO. See you at the next concert. With just one more sleep till our first concert of the year, audiences at the Mosman Art Gallery should prepare to be blown away by Baroque trumpet virtuoso, John Foster who will be our soloist, performing the Neruda Trumpet Concerto. John is one of the world’s foremost exponents of the natural trumpet. He has toured all over the world performing as soloist with leading orchestras in Europe and America. He has made several solo recordings, published 2 books, and is also much sought after as a teacher. He is the director of the Australasian Trumpet Academy, which draws artists from across the world to Australia. John’s passion for his instrument has led him to amass a collection of over 100 trumpets from many different periods of history. There is a dedicated room in his house where he displays most of the collection in glass cases, but John says the collection has a tendency to spread all through the house. John even has a trumpet that is named after him. He worked in collaboration with Barlow & Martin Natural Trumpets in Norwich, England, to develop the Foster Model Natural Trumpet. When asked if he has a favourite instrument, John says ‘that’s too hard. It’s like asking if you have a favourite child.’ He goes on to say that there is a couple of Baroque trumpets of which he is particularly fond. John’s collection has been featured on the ABC television series, The Collectors and also on Channel 7’s The Morning Show. In his Mosman concert John will be playing a modern trumpet, as Mosman Symphony Orchestra plays on modern instruments. The concert also features music by Wagner and Beethoven’s much loved 7th Symphony. Beethoven’s glorious 7th Symphony has been described in many ways, but it is interesting to note how often the descriptions touch on dance & celebration. It was certainly a favourite of Beethoven himself, who regarded it as one of his finest works. He must have felt an added affection for it as the enthusiastic reception of its first performance, with demands for repeat performances, rescued him from serious debt. The piece has continued to delight and inspire players and audiences ever since. Yet for all the symphony’s joyous energy, it is the hauntingly beautiful 2nd movement Allegretto that has been the most loved. Encored at the premiere, it was often performed as a stand alone piece in concerts & sometimes substituted for the slow movement in performances of Beethoven’s earlier symphonies. This is no bacchanalian revel, but the sense of movement and dance is still present in its measured, pulsing rhythm. The movement has been used in popular culture both to convey and to elicit strong emotion. In this heartbreaking scene from Mr Holland’s Opus the high school music teacher drops the needle onto the record player to play the 2nd movement as he tells his students about the circumstances of the composition of the 7th Symphony as Beethoven confronted his growing deafness. Just try to imagine Beethoven, standing on that podium, holding his baton, his hands waving gracefully through the air, and the orchestra in his mind is playing perfectly; the orchestra in front of him trying desperately just to keep up. ‘Well… Beethoven wasn’t born deaf’. Mr Holland answers. Holland’s son was born deaf and will never share his father’s love of music. In The King’s Speech, the same music provides a moving counterpoint to the climactic scene when King George VI, ‘conducted’ by his speech therapist, Lionel Logue, overcomes his debilitating stutter to make the fateful radio broadcast to the British Empire declaring war on Germany. The relentless forward movement of the allegretto and its measured slow build, reflects not only his personal determination and growing confidence, but the strength & resolution that he is asking of his audience. On a less elevated note, Beethoven’s 7th also features prominently in that classic movie, It’s the Easter Beagle, Charlie Brown. In the excerpt below, Sally’s disappointment with Linus at the apparent non appearance of the Easter Beagle (‘never trust a man with a blanket‘), and Charlie Brown’s usual lamentation over his lack of friends is accompanied by a melancholy piano rendition of the 2nd movement before the joyful 3rd movement ushers in the appearance of a dancing Snoopy as the Easter Beagle. Funnily enough, the same movie features Snoopy dancing with some Easter bunnies in a scene strangely reminiscent of the Matisse painting, La Danse, which we have chosen to illustrate our concert, the Apotheosis of the Dance. We do hope you will join us this coming weekend to share some wonderful music, and stay after the concert to chat with the players. I can’t promise Bacchanalian revels, but there will be complimentary champagne and nibblies. There are some lovely concerts of Christmas music coming up at the Cardinal Cerretti Chapel in Manly. On Dec 2nd at 7.30 Music at Manly is presenting a fun-filled concert and a sing-a-long, to start your festive season. There will be brass and solo vocals, culminating with the Hallelujah Chorus from the Messiah. For more details click here. Dec 3rd & 4th sees the Manly Warringah Choir with orchestra & soloists performing Karl Jenkins’ Stella Natalis and Tchaikovsky’s Nutcracker Suite, as well as carols for choir & audience. The conductor will be Carlos Alvarado, who conducted our recent Movies concert to great acclaim. For more details click here. In the dark of remembrance I rested, mesmorised by the complex “Concerto for Two Violins in D-minor” – a divine concertante: and blossoming from the Mosman Symphony, it delivered my mortality to the sweetest glimpse of infinite Grace. Three cheers for all those sonorious gems that have ever poured from your vat of loveliness, Richard Wagner: your vintage continues to intoxicate classical culture-vultures everywhere. “Siegfried Idyll” was a very satisfying selection from the orchestra’s music cellar, and we quaffed on that rare beaujolaise enough to quench a sailor’s thirst. Pour me another damn it – and another! “Sorte’ Sobriete”! And why not? It caused the earth to move for me, and apparently did wonders for the enraptured juices of Cosimo, until Richard flogged-off this beloved gift to her, presented with some ritual and ceremony, to all and sundry; and that’s men for you! Was it a mere rush of blood to the head on sighting the panorama of a new century, that sparked pleasant and optimistic harmonies in the first movement of Jean Sibelius’ second symphony? – I think not! They’re a mask for what was to come – and it wasn’t pretty! – MoSO you nailed it! This great work is no walk-in-the-park, and should not be misunderstood or underestimated: its calibre is on par with Beethoven, however, the similarity ends there. Beethoven was on the whole a reactionary for his time, Sibelius channelled the future with dark tones, warning of the disaster that was to unfold onto a humanity flawed with the deadly emotions of pride and greed – “Art” with a capital ‘A’! His carefully considered timings, intricately designed-rhythms and sumptuous harmonies? – Well, we can surmise their veiled or implied meanings, and argue the toss infinitum – but we’re bound to enjoy the ride, as we did! By the way, it was the best interpretation I’ve heard. PS: Looking forward to more of your great performances. Apart from wonderful classical music in a lovely venue, one of the really great things about Mosman Symphony Orchestra concerts is the champagne and nibblies afterwards, when the players get to relax and chat to the audience. When people talk about music that has stirred them they are often very eloquent – sometimes poetic. We thought it was about time that we had a permanent record of some of the lovely things that people say to us after our performances, so we now have a Guest Book. If you’re coming to our Sunday performance, we’d love you to share your thoughts in the guest book. There are still some seats available, but you’ll need to be quick! ‘It was a fabulous concert, my first time at a concert of the Mosman Symphony, and I couldn’t have enjoyed it more. My spirits needed lifting, and Mosman Symphony Orchestra most certainly did that! The music choices were perfect, the order of play was so well organised and the acoustics were fabulous! I would really appreciate being placed on the mailing list and am really looking forward to attending the next concert and into the future. Spring arrived when the flowers bloomed last week, and as the charming conductor, Carlos Alvarado took to the rostrum, raising his baton elegantly to lead our sublime Mosman Symphony Orchestra through a selection of music from cinematic history. Composers Johann Strauss and Edward Elgar to “Harry Potter’s” themes of haunting mysticism were on the program, and the orchestra confidently performed for an appreciative audience that yearned for more. A memorable arrangement from the movie, “Schindler’s List” elevated my mind to a space where only tolerance and peace prevail. Anny Bing Xia achieved a seamless, sweet hypnotic interpretation in that violin performance, and blew me away. Anny, you’re a “Musician’s Musician” – play on! “Jaffas” were not rolled down the aisles, and precedents can’t be tolerated I’m sure – however, it wouldn’t have taken much for exemptions to be brought forth as the exhilaration of “Radetzky’s March” raised the house, and closed a fabulous evening of block-buster music.